Dr. Agatha Caraballo is a Digital Instructor and the Director of the Bachelor of Public Administration program in the Department of Public Administration at Florida International University (FIU). She earned both her PhD in Public Affairs and Bachelor of Science in Communications degrees from FIU. Her research focuses on community development programs, diversity and inclusion, and corporate social responsibility. 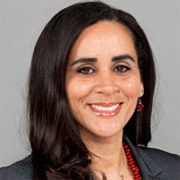 She presently serves as the Director of the Council for Corporate Responsibility and is a board member and committee chair for several other organizations, including the South Florida Chapter of the American Society for Public Administration (ASPA), the South Florida Diversity Council, ASPA’s Section for Women in Public Administration, and the Public Administration Theory Network 2014 Conference Host Committee. Dr. Caraballo is also a member of the United States Technical Advisory Group in Human Resource Management for the International Organization for Standardization (ISO) and the American National Standards Institute (ANSI), a committee spearheaded by the Society for Human Resource Management (SHRM). As a former Financial Aid Advisor and Career Development Coordinator, she is proud to mentor several high school and college students. She is married with two children and resides in Miami.